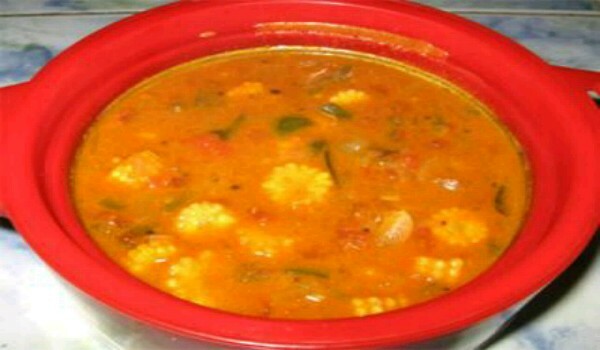 Baby Corn Gravy is a delicious, mouth-watering delicacy from the Tamilian cuisine. Learn how to make/prepare Baby Corn Gravy by following this easy recipe. Place the baby corns in a cooker, along with some salt and pressure cook them until soft. Remove and cut them into small pieces. Chop onions and tomatoes separately. Place a pan on fire and heat oil in it. Add mustard seeds and fennel seeds. When they splutter, add the chopped onions. Stir fry the onions until they are golden brown in color. Add in the ginger-garlic paste and stir fry. Now, add the chopped tomatoes and mix well. Mix in baby corns and saute for a few minutes. Add chili powder, coriander powder, garam masala powder and little water. Stir well. Now, cover the pan and cook for 2 minutes. Remove and serve hot, with naan, chapaati or roti.